If you’ve not bookmarked Rugby Dump, click the link and do so now! It’s a great site which features highlights from around the rugby world every few days, and I’m glad to see one sub-set – on the history of rugby – finally be completed recently. In particular, I wanted to post the last two segments which feature England under Clive Woodward (coach from 1997-2004). I’ll write about him later, as I’ve just started his autobiography, but having witnessed his rough early days to the wonderfully constructed World Cup winning team of 2003, it was hard not to support them as they were so clinical. If you didn’t get a chance to see them, there are some great clips below. 1. Forwards carrying powerfully, with support. Ball being moved away from the tackle contest (ruck / maul) QUICKLY, before defenders have time to re-align. Forwards also getting involved in the back line, effectively passing rather than ‘dying’ with the ball in contact when there’s space and men to spare. 2. Balls being passed just before or from contact – to someone who’s almost definitely calling for it (not thrown away in hopes someone will be there), maintaining the continuity which NEVER ALLOWS the defence to get organised. These runners are also taking the offloads very close to the line and running through spaces at pace. 3. Passes being put IN FRONT of runners so they do not have to adjust their speed. Wilkinson’s famous for his boot, but he has a lovely long pass, as does Greenwood, Catt and Healey. EARLY / DEEP PASSES allow the speedsters time and space to take any line they choose and LATE / FLAT put people through the gaps. 4. Support runners hitting the line at pace, with PERFECT TIMING. Support runners also ALTER ANGLE OF RUNNING to take advantage of defenders out of position or not focused on what’s going on around them. (This one isn’t as obvious to someone who’s never considered how running angles work before, so have a look at any of their tries which seems to come from a change of angle, rewind and assess: a) Which defender should have picked up that player? and b) Where were their eyes and hips facing? It’s often that they’re looking inward, at where the ball came from, and not forward, in alignment and in communication with their team mates, focused on the threats in front of them and trusting their team mates close to the ball.) These are great opportunities to take advantage of Unders / Overs lines and tell the ball carrier you’re doing so, thus making his/her job of distribution easier! Jonny’s still a great fly half, but that team benefited from having quite a few intelligent, tactically minded players around him who made the entire team smarter and more aware. If you didn’t get to see them the first time around, I hope you enjoy watching them as much as I did – and do again! As has probably been mentioned in this blog before, I started rugby as a late teen – which is all-too-common for most Canadians – in the late 90s. Now it might have been because we were in a bit of a backwater area, or because it was Canada where we pick up on new trends a bit late, or maybe it was a bit a ‘revolution’ but a few years later more people were talking about becoming specifically organised at the tackle contest. I attended a coaching course in which former national sevens coach David Hill explained how the area around the tackle contest was the most critical to defend, because a breach there would force your entire team to turn and chase, and to lose sight of the other attacking players. As mentioned in other articles, it’s easier to defend when your opponents are in front of you. As an attacker, you can pick your weak spots with ease when the entire defending team has their backs to you and are singularly focused on stopping the line break. The following diagram has been borrowed from a New South Wales coaching document entitled “Effective Team Defence – Attacking opposition possession through effective defence” (2004). It comes from their Coach Education Series, which used to be available from their on-line coaching site, which is now subscription based. Simply put, after a tackle has occurred, a good team will first shore up it’s new defensive line on BOTH sides of the ensuing tackle contest. The numbers of people a team throws into a counter ruck is debatable, and quite often changes with field position / game plan / score / time left in the match / etc. But after that, the NEXT players need to start building their defensive line from the inside-out. So what are the actual responsibilities of these players? In the diagram, you can see how they are stacked up and aligned relatively flat with one another, thus preventing any obvious gaps to attack and ensuring the line has a better chance of advancing together. As the D1 and D2 aren’t necessarily marking anyone, they have to be focused on what their roles are and work together. D1 – has the responsibility of the gap closest to the tackle contest and should be close enough to touch it. NO ONE can get through this gap and when there’s time for players to get into ‘better’ positions (i.e. forwards closer, backs wider), this person never leaves that gap until the ball is long gone. If he/she leaves, a clever scrum half or forward would snipe into that space and at least make the entire line retreat and re-organise, if not make a clean break. So this job is about protection, but it’s also about pressure. When ready and organised, and on the “UP” call, D1 – on BOTH SIDES – must put pressure on the passer or picker. If caught, this is a great opportunity to steal as the attacking team’s support has to come back while the defensive team should already be moving forward together as a unit. If an attacker decides to run into this well-guarded space, a tackle in behind his/her previous ruck has a very low chance of being contested for again, and should also be considered a great opportunity to steal by the other D1 and the scrum half. D3 – has the easier-to-explain role of marking the first receiver, who is most often the fly half. When the attacking team is quite effective at securing their own ball, it’s advantageous to the defending team to get as many defenders on their feet as possible. This might mean not contesting a few rucks so that more defenders can work at smashing the attacking team behind the gain line, and therefore with less support, during a later phase. Note how the South Africans are poised here to ‘attack’ the English on defence, prompting them to a less-effective, but safe pick-and-go. With South Africa already organised and on the front foot, ready to rush up, the English would need a great move to NOT be caught behind the gain line should the decide to go wide. It looks as though they’re correctly going to pick and drive to force the South Africans to re-organise their line, and possibly then go wide (but knowing England, this isn’t very likely until after a few pick-and-drives). The one correction I’d make here is that too many South Africans are pointed inwards, as a friend says ‘ruck inspecting’, rather than keeping their bodies forward, focused on who they’re defending. In this, case, they probably know the pick-and-drive is coming, so can be forgiven, but should the ball go wide the D3 defenders will first have to turn their heads, then hips, forward before they can rush at the backs. This might only be a second or two, but can be enough time to start something. What I demand players do is have their INSIDE foot up, which will square up their bodies, forcing any inward looks to be done with the head only, not the whole body. I think on top of simply being organised, the crucial element in getting organised at the tackle contest is communication. If a team has honest trust in their own and their teammates’ abilities, then players can start to assess the situation at the tackle contest and call their intent even before they get there – a good scrum half should be directing this as well. The last team I coached was really quite good as saying “I’ve got A” / “I’ve got B” (we use A-B-C) as they were approaching the contest. If defenders get into these positions quickly, calling out their responsibility, it allows everyone else to consider that spot secure and allows them to move directly into wider positions. Often at lower levels this is not the case and too many players flock to the tackle contest, leaving massive gaps or space out wide! I was recently engaged in a short debate about communication on the field and I discovered that I seem to occupy a modern mentality that there’s nothing wrong with a lot of chatter. That said, I hear too much repetitive chatter that I fear becomes white noise after a while. Players yelling ‘ballballball!’ is a common one which offers nothing unless the passer has a level of sensory perception to determine exactly where that person is. It’s this kind of talk on the field I discourage, instead demanding that players keep their directions short and specific – single words if possible, monosyllabic ones at best. In the past, I’ve created a master list of words we’d use and included them in a ‘playbook’ for every player at the beginning of the season. Recently, we’ve worked this out together – adopting common words that players have been using before I came on board – and published these on a freely built team website for future reference. I’ve talked about communication on here before, but lately I’ve been stressing to players that support runner communication can be instrumental in a successful attack. At this specific level, many players had not honed their decision making skills and coordination to such a high degree that they could simply read the ball carrier’s body language. Taking a step back, most players didn’t necessarily have the vision and game sense to initiate effective multi-player moves themselves. So while we trained such decision making abilities – focusing on seeing space, reading defences, and realising our strengths versus their weaknesses – I continued to stress that this was not always the responsibility of the ball carrier. In fact, with the relative lack of experience on the team, I threw the idea out there that the support runners should have MORE responsibility than the ball carrier in most situations. In challenging them to get to know their team mates’ abilities, they would hopefully have recognised that a few of our players were great at this. But even the best players miss opportunities at times when the pressure is on – and that is the point of asking supporting players to contribute their voices. Focused on a narrow space in front of them, with an impending tackle, all but the most experienced and savvy players will be focused on that immediate threat and not necessarily what the other options are. 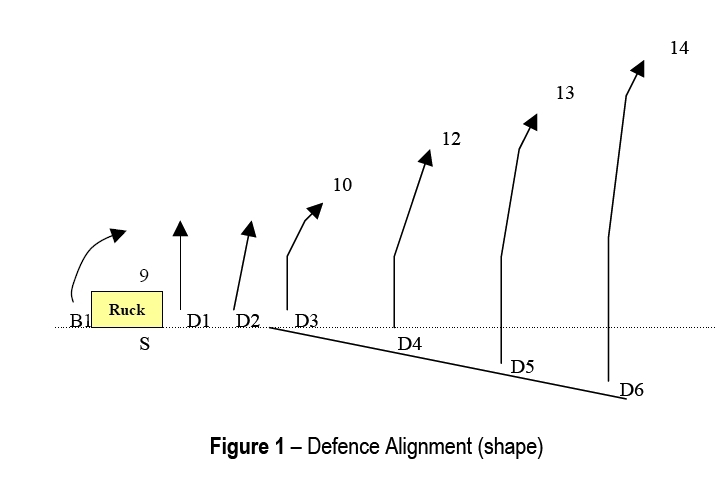 With less pressure on them, the supporting players should – in addition to gauging how much support the ball carrier needs – scan for other opportunities and use the ‘short and specific’ guidelines to communicate them to the ball carrier if it’s truly on … and even if it’s not going to be acted upon, as sometimes the defence will react to this allowing an aware ball carrier to take advantage of an overzealous defender. I’d say this starts from even before the play has been started, with a supporting player simply reminding a potential receiver know “I’m on your left”. Sometimes the focused receiver isn’t even aware of that! From there, early is better so the ball carrier has time to process the information. Short and specific communication, therefore, makes this information transfer more effective in a VERY short window of opportunity. Starting at 1:58, and on to the ruck that Wasps scrum half Nic Berry clears to fly half Dave Walder. Just as Walder gets the ball (I’m sure) you can hear Varndell yell ‘Switch!’, which Walder hastily tosses to him. In this instance, Walder didn’t seem to have anything on but was at least going to have a go at space with quick ball. Varndell recognises the opportunity on his inside and calls the switch – rather than Walder initiating and Varndell reacting. 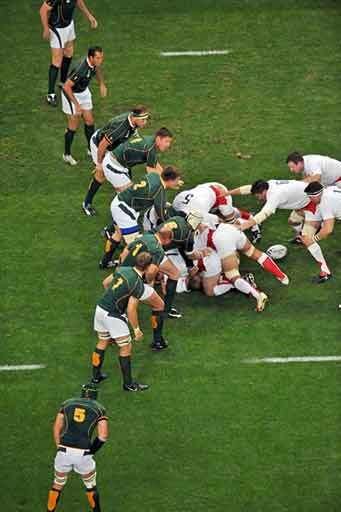 For the reason I mentioned above – often the ball carrier’s got too much to think about, with all kinds of pressure on him – I demand this kind of communication (for the ball carrier to at least consider, if not act on, still relying on his vision to see how the defence reacts) from the supporting players.